Home Other Articles Eight-Thousanders: What Are the Eight-Thousanders? The eight-thousanders are the fourteen independent mountains on Earth that are more than 8,000 metres (26,247 ft) high above sea level. They are all located in the Himalayan and Karakoram mountain ranges in Asia. The first recorded attempt on an eight-thousander took place on the expedition by Albert F. Mummery, and J. Norman Collie to Nanga Parbat in the territory of Kashmir (in present day Pakistan Administered Kashmir) in 1895; this attempt failed as Mummery and two Gurkhas, Ragobir and Goman Singh, were killed by an avalanche. The first recorded successful ascent of an eight-thousander was by Maurice Herzog and Louis Lachenal, who reached the summit of Annapurna on June 3, 1950. The first person to climb all fourteen eight-thousanders was Reinhold Messner. He completed this task on October 16, 1986. A year later, in 1987, Jerzy Kukuczka became the second climber to accomplish this feat. As of 2010, a total of 21 people have followed through undisputed. This is an extremely hazardous feat; at least four people have died while in pursuit of this goal. Juanito Oiarzabal has completed the most climbs of the eight-thousanders; a total of 24 times since 1985 to 2010. The country with the highest number of climbers that have climbed all fourteen eight-thousanders is currently held ex aequo by South Korea, Italy, Poland and Spain with three climbers each. The first woman who claimed to have summited all 14 eight-thousanders was Oh Eun-Sun of South Korea, stating she completed the set by summiting Annapurna on April 27, 2010. Doubts about this claim have been raised by several parties and an inquiry by the Korean Alpine Federation (KAF) declared her summit claim for Kangchenjunga 2009 "unlikely". Their doubts add to those previously brought forward by rival Edurne Pasaban, which moved Himalayan chronicler Elizabeth Hawley this Spring (2010) to tag the summit as “disputed." The Himalayan mountain range with Mount Everest as seen from the International Space Station looking south-south-east over the Tibetan Plateau. 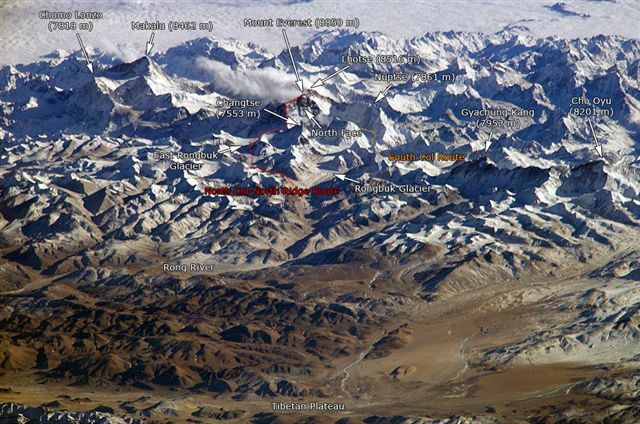 Four of the world's fourteen eight-thousanders, mountains higher than 8000 metres, can be seen, Makalu (8462 m), Everest (8850 m), Lhotse (8516 m) and Cho Oyu (8201 m). The South Col Route is Mount Everest's most often used climbing route.